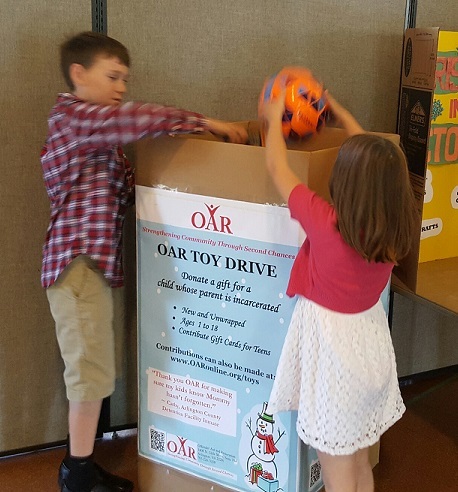 Each year in October, OAR hosts a Toy Drive to collect new, donated toys and gifts for children of incarcerated parents. The gifts are given in December through OAR’s Project Christmas Angel. Parents in the Arlington County Detention Facility, as well as parents who have been recently released, are on probation, or are active in OAR’s programs may be eligible to send gifts to their children in this program. OAR does this in an effort to bridge the gap between those involved in the criminal justice system and their children, as these relationships are often strained and challenged during and after incarceration. Donated toys and gifts should be new and unwrapped and appropriate for children ages newborn to 18. OAR does not accept donations of clothing or stuffed animals. Gifts for teens are especially needed, as most of the children eligible to receive gifts are between the ages of 12 and 18. Purchase gifts for teens via OAR’s Amazon wish list and have the items shipped to OAR’s office. Please include your name and contact information so we know who the donations are from. Purchase gift cards for teens. Denominations of $20-$25 to places like Target and Amazon are most needed. Purchase gifts and drop them off at OAR’s office during business hours (1400 N. Uhle Street, Suite 704, Arlington, VA 22201; Monday through Friday 8:30am-12:00pm and 1:00pm-5:00pm). Donate via OAR’s website to help fund the project. We need to purchase items such as wrapping supplies and postage to mail gifts to children that live outside of the DC area. Be sure to indicate on the “Messages or Comments” line that you’d like your donation to go toward Project Christmas Angel. Volunteer as a driver to help OAR pick up donated items from sites around Arlington and the metro DC area. More information will be coming soon about ways in which to get involved with OAR’s Project Christmas Angel in December. The event will be held Wednesday, December 14, 2016 from 6:30 to 9:00pm at St. Andrew’s Episcopal Church. RSVP information will be posted to OAR’s website in November.